How many orphan blocks do you have in your stash? Here’s a great idea for the end of summer. Use them in a project and you could win a phenomenal prize package! (Including a BERNINA Sew Essential Tool – a sewing kit in a Swiss knife!) Check out The Great Summer Orphan Block Challenge at Hummingbird Highway! In her weekly eZine, “Good Migrations,” Joan Ford challenged quilters to go to their stash, find an orphan quilt block – any block, any size, with at least one seam sewn – and make something. The GREAT Summer Orphan Block Challenge was ‘hatched.’ Readers are encouraged to take a ‘before’ picture of the orphan block and an ‘after’ picture of the finished project and submit it to Hummingbird Highway along with some short background details. Since it’s summer, and nobody really wants to fling around king-sized projects in the heat, a small project is as perfectly acceptable as a large project. For more information visit Hummingbird Highway at http://scrap-therapy-quilts.blogspot.com/ The deadline for entries is September 21, 2012. Over the course of the summer, you can follow along with the weekly “Good Vibrations” eZine delivered right to your email inbox for free (you even get a free pattern for subscribing!) or watch for blog posts and Facebook entries at hummingbird-highway.com. Periodically through the summer, Joan is offering tutorials and inspiration as she makes a variety of small projects from orphan blocks from her stash. Her BERNINA sewing machine is humming with all kinds of ideas for projects like placemats, pincushions, small quilts, oven mitts, and so much more. You might find inspiration from other designers, too! 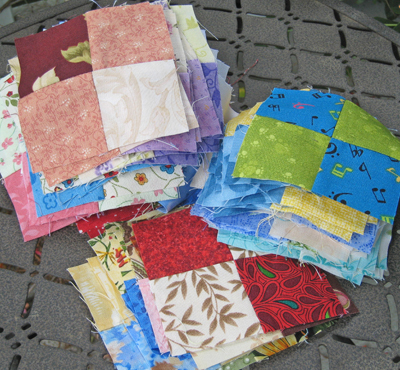 Joan’s Orphan Block contest has inspired me to dig up all my unfinished quilts and see what I can make, too. 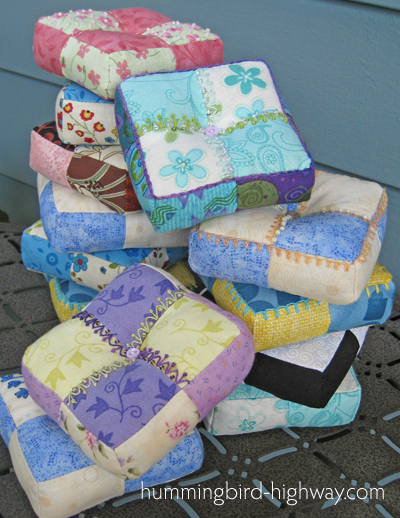 Who would have guessed that I have blocks for at least four different BIG quilts? That’s a lot of orphan blocks!